There are many opportunities within the Biology Department for students to get involved in scientific research. During the academic year, students can work in collaboration with a faculty member to complete an independent study. To do so, students enroll in the independent study as one of their courses for the semester. Seniors have the option of pursuing honors by completing a two-semester project culminating in a written thesis and a presentation to the department (along with accompanying additional expectations). 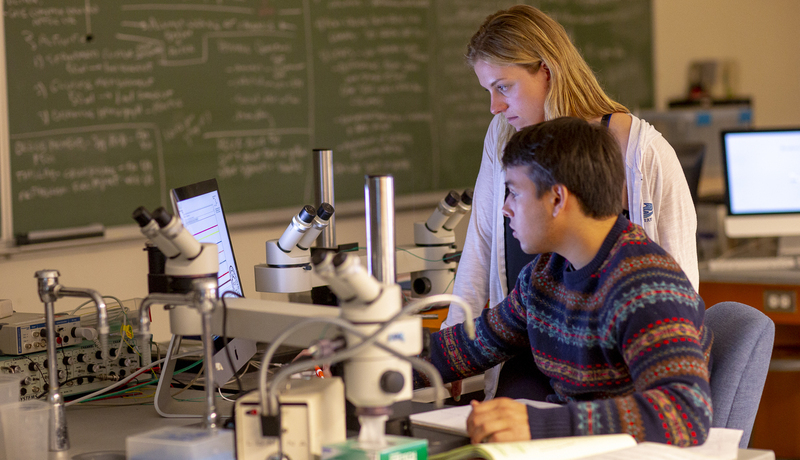 Students can also spend 8-10 weeks during the summer conducting research in collaboration with faculty, either on campus or at the Bowdoin Scientific Station. These summer research fellowships provide both a stipend and funds for research supplies. Finally, there are many summer research opportunities at other academic institutions around the country; a good place to begin searching for these opportunities is here. How do you get started? It is always a good idea to meet with a faculty member to discuss research opportunities at Bowdoin. The faculty web pages give brief introductions to the ongoing research of each faculty member. Check out these pages, looking for research that you find interesting. Then simply contact that faculty member and ask to meet. For independent studies and honors, it is a good idea to contact the faculty member well before registration, so they can let you know whether they are free to mentor you and also to guide you in project design. For summer research fellowship opportunities, which has an application process beginning in February, contact faculty beginning in late November or early December for the same reasons. Faculty can also guide you into NSF REU and other off-campus opportunities.